In southern Malawi, near the border with Mozambique, the land rises sharply into a multi-lobed plateau that towers about 1,400 meters (4,600 feet) above the landscape. The feature, an inselberg known as Mulanje massif, is the highest point in south-central Africa. The rock that makes up Mulanje formed some 130 million years ago, when underground magma slowly cooled into vast lobes of granite and syenite. Over time, tectonic forces pushed these erosion-resistant rocks upward. As softer rock above and around the granite and syenite eroded away, Mulanje was left behind. Today, about twenty rocky peaks are found on the plateau. 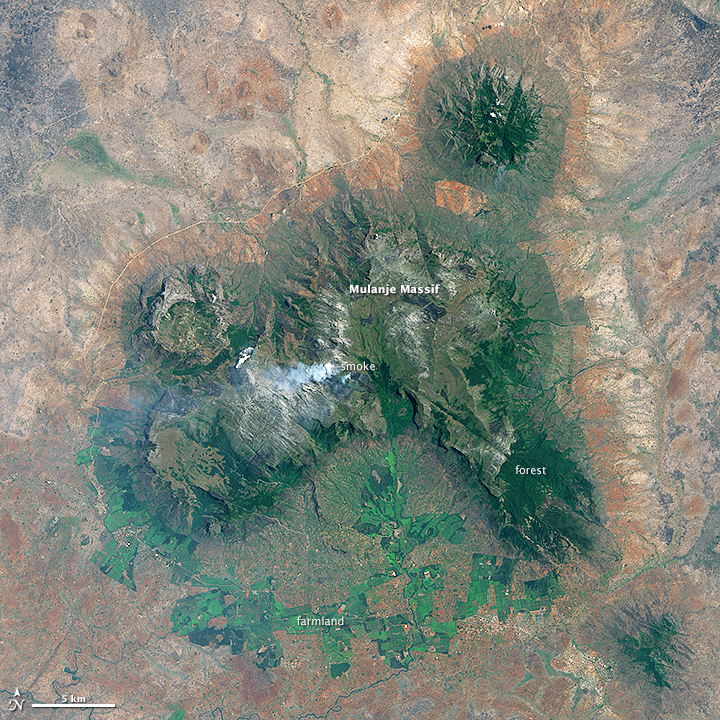 The Operational Land Imager (OLI) on Landsat 8 captured [the above] natural-color image of Mulanje on October 10, 2014. Since the image was acquired during the dry season, browns and reds dominate the lower-elevation areas surrounding the plateau. Dry grassland, shrubland, and farmland appears tan; it normally greens up during the wet season. Areas with exposed soil have a red-orange hue. The bright green areas south and west of Mulanje are tea and macadamia farms. While the lowlands get most of their rain during the wet season, the plateau sees rain year round. Vegetation type varies with elevation. Mulanje’s lower slopes are mainly miombo woodlands. The mid-elevation and upper slopes, as well as many of the ravines, are home to afromontane forests, which have a darker green color. A few scattered groves of endangered Mulanje cypress (Widdringtonia whytei)—Malawi’s national tree—survive in certain valleys. Tussock grasslands and heath dominate the highest-elevation parts of the plateau. Large outcrops of exposed rock appear gray. Although conservation groups have attempted to protect Mulanje’s forests, satellite observations show that deforestation has chewed away at the perimeter of many of them over the last decade. The lowlands surrounding Mulanje are densely populated, and people regularly harvest wood for cooking and heating, explained Joy Hecht, an environmental economist and consultant. A wildfire is visible on the plateau in the Landsat image. “Fires are frequent and a bad sign, often set by illegal loggers,” said Hecht, who has conducted field research on Mulanje. “The mountain top is a protected forest, and there would not be prescribed burns there.” Other common causes of wildfires on Mulanje include hunting, charcoal production, escaped campfires, and arson.